Half of Americans live in suburbia. And, for those that do, in the abodes, humble or otherwise, that we call home, attached are typically front-, back- and for some, side-yards. As such, a person could conclude, these green spaces go with the territory. Adding to this I contend, size-wise, in a front-to-back-yard comparison, the yards fore, cover the most ground (if you’ll excuse the pun). Interestingly, we that have chosen the suburban way of life, the front yard replete with lush green acreage that we seem to go to great pains to to keep up, when at home, it is the area behind our homes that we go to first when we wish to spend time outside. Rarely to never do I see anyone engaged in recreational activities in the yards in front, which tells me that the land in front is mainly just for show? Do set the record straight if in this regard I’m off base. Unlike at other properties in close proximity to where I reside, I basically do a “once-over” when it comes to the lawn mowing chores, using a cordless electric mower and at times when it is conducive to doing so. To be fair, there are some neighbors who have xeriscapes that require no mowing at all. I see that as a good thing – the less mowing involved the better, not only from an air-quality standpoint, but where noise pollution and water conservation are also concerned. Incidentally, as a keen observer who has their finger on the pulse as it relates to such activity, I can’t help but notice the regularity with which the armada of yard-upkeep forces show up (that is, if the home owner doesn’t do the unglamorous yard work him- or herself) – so dependable, that I could almost set my clock by this. Back on point, for the post-mow operation, I use a dustpan and broom. It cuts down on the amount of dirt, debris and dust that is usually kicked up with an automatic blower. Add fumes to the equation if the blower motor is of the internal-combustion type which, more often than not, it is. And, those fumes can travel a relatively long ways (the distance covered equivalent to the length of several homes sitting side-by-side at least). Add to this that repeated use over extended periods as has been shown in studies can to lead to both respiratory discomfort and harm. 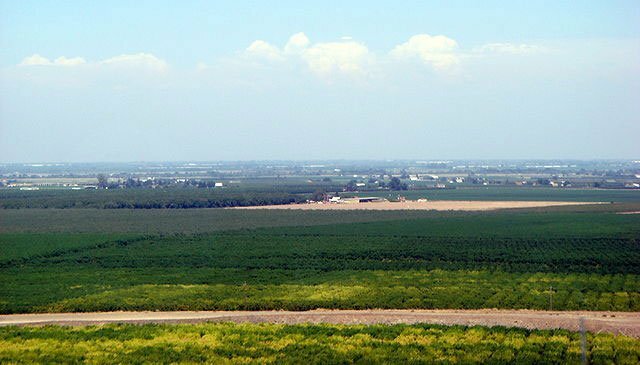 In the locale I call home – California’s central San Joaquin Valley – which has some of the most toxic air pollution in the nation, not a distinction we are proud of by any measure it should be noted, the growth in suburban housing coupled with and fueled by population rise, obviously, has prompted a glut of said home building. Fortunately, starting in 2020, all new California homes built are required to be outfitted with solar panels. If there can be found a zero-emissions motor vehicle parked either in the driveway or the garage on a day-to-day basis used to meet said home inhabitants’ daily travel needs, so much the better. As for the home lots themselves, these will no doubt have green spaces set in front. Would that it should be standard fare, this can only mean one thing: more lawn maintenance and more watering activity. As an aside, lawn watering is right now restricted, in Fresno County anyway, to Sunday. Part and parcel of the former activity is grass cutting and going with that dirt, debris and dust-blowing. The usual when it comes to lawn care, to be sure. An extended season for such coupled with use of internal-combustion-engine (ICE) powered lawn-care equipment and the chance for poorer air quality is made even more likely. If this and other air-polluting activity is what is contributing to a warming planet and hence the longer grass-growing period, then all internal-combustion-engine powered yard-grooming activity occurring alongside ICE use in general cannot be helping matters. The way I see it the solution is the overwhelming use of appliances that either don’t pollute or that pollute way, way less. Besides helping save the earth, for us that do this type of work, our lungs will thank us for it as they’ll be getting a much welcome break to boot. And, who, I would like to know, cannot get into that? This post was last revised on Nov. 5, 2018 @ 8:20 a.m. Pacific Standard Time. I agree that one can reduce one’s carbon footprint is to popularize the use of appliances that add either a little to no carbon emission to the atmosphere. My tip is to prepare a suburban landscape with lots of trees. Trees can help absorb carbon dioxide, which reduces the amount that will be sent back to the ozone layer, thus slowing its collapse. However, before planting a tree, one must prepare the soil through a soil preparing company in order to avoid landslides and keep the trees standing at the same time.